Mikasa is a leading brand and online retailer of China and Dinnerware sets found at Mikasa.com. The store is particularly generous in terms of offers and deals, and we list all the latest Mikasa coupons here at Coupofy to redeem them. The subsidiary company is based in Garden City, New York, United States, and is owned by the publicly traded Lifetime Brands, Inc. corporation. As well as selling directly to customers through the website they also supply third party retailers across the United States. In this case sometimes you can use a Mikasa printable coupon for in-store products. Misaka was founded in 1948 by George Aratani, though it wasn't known as Misaka until the late 50s after a rebranding. Aratani would import dinnerware from overseas and sell it on to other retailers. As the brand grew his products were found in high end outlets like Bloomingdales, Macy’s, and May Department Stores, and they became known as a pioneer in tabletop fashion. Over the years their selection has expanded to include a comprehensive range of Kitchen and Dinnerwares. Jeffrey Siegel currently serves as CEO of the company. 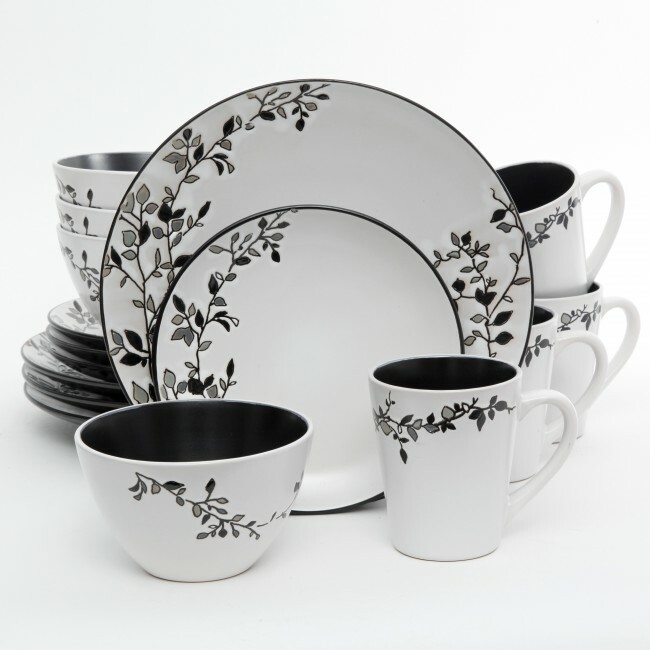 Mikasa's selection includes Fine China, Crystal, and full Sets. Here's what you can find in each category. Dinnerware: Appetizer, Bread & Butter and Dinner Plates; Fruit, Pasta, Salad and Soup Bowls. Servingware: Cake Plates, Vegetable Bowls, Buffet & Warming Dishes, Trivets, Gravy Boats, Butter Dishes, Salt & Pepper, Sugar, Creamer, and more. Drinkware: Beer Glasses & Coasters, Wine Glasses, Goblets, Champagne Flutes, Cofee Mugs, Teacups & Saucers, Espresso Mugs, Iced Glasses, Tall Glasses, and more. Utensils: Knives, Cake Knives & Servers, Salad Servers, Ladles, and more. Home Accents: Candlesticks, Bowls, Vases, Picture Frames, Wall Decor, Decorative Trays, and more. You easily browse the site via these categories or use the search bar if you have something specific in mind. There is also a separate sales page where you are sure to find a bargain. If you are buying somebody a gift but don't know what to get, you have the option of buying a gift card (values between $15 and $100) so the receiver can redeem it for their own choices. The online store also has wishlist and bridal registry services. To redeem a Mikasa coupon code, simply click the offer you want on Coupofy and the code will be displayed in a window. Copy and paste this in to the promo box on the store site and you should see a confirmation message. The box is located just before payment. Mikasa accepts all major credit cards (Visa, MasterCard, Discover and American Express). Debit cards are accepted as long as they have the Visa or MasterCard logo on them. Mikasa gift cards can also be accepted for all or part of your order. You can also checkout with Paypal or Bill Me Later. Mikasa currently only serves customers in the United States. 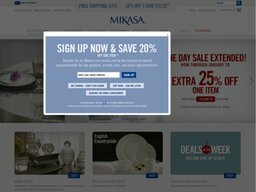 All orders over the value of $99 qualify for free Ground Shipping without the need for a Mikasa coupon code, and takes between 5 and 7 business days. Below this threshold and it costs a flat rate of $8.95. You can also pay extra for faster options including 2nd Day (starting at $19.95) and Next Day ($34.95). The larger the value of the order the more expensive these options become. Shipping to Alaska, Hawaii, and US territories also cost extra and take longer to deliver. Mikasa have two return policies. Sale and clearance items must be returned within 30 days of purchase, while regularly sold items have up to 90 days. All unwanted items must be in the original brand new condition to eligible, unless of course you are returning an item that was damaged or defective upon receipt. In this scenario you must contact customer support to verify the return. Of course if you have used any Mikasa online coupon to get a discount you will only be refunded the actual amount charged to your payment method. surprise! i'm not dead! everyone else is, though. i wonder what jean was thinking when he decided to dress up as eren. if it was "maybe mikasa'll think i'm cute," then he did it for nothing. why couldn't petra cross the road? because dead bodies don't move. do jean and marco get discounts on dates since only 1.5 are attending?